Today we showcase a story of another successful entrepreneur, Che Metcalfe, founder of Podmo from Adelaide, Australia. Podmo Mobile is a free mobile network for end users. I grew up in Townsville and left for Sydney when I was 17 to get Guitar lessons. After a year or so I returned to Townsville to form a band, which we took to Adelaide. We won battle of the bands at our first gig and did a lot of big support gigs for bands like the Angels, Southern Sons and Johnny Diesel. After a tour to Sydney it dawned on me that I may work my but off in this industry for many years and get nowhere, so I left the band and decided to study. I enrolled in a Building Design and Drafting Diploma at TAFE where I first started using computers. I was quite poor so I bought myself an old 486 which continually broke down and I needed to rebuild it all of the time. This was a very quick way to learn about computers and spurred me on to start my own computing business at the end of my studies. Podmo empowers our partners by allowing them to deliver their own mobile offering. For instance if I am a retailer I can set up a Podmo node in my store and use that node which is part of the whole Podmo network to promote my business directly to my customers for no ongoing cost. It also greatly improves the viability of mobile content producers by providing them with the tools to self publish. Podmo also provides a very healthy revenue share to our content partners. Because there are no data charges for the consumer we remove one of the biggest barriers to the uptake of mobile data services. 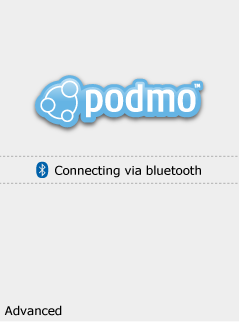 Podmo uses Bluetooth and WiFi to achieve this at no cost to the end user. Podmo is NOT a Bluetooth spamming server that many people are now familiar with, it is a fully fledged mobile telecommunications system providing, browsing, search, maps. IM, VoIP, downloads, uploads, social networking and more. The concept for Podmo was mine but it was actually built by the team from Kukan Studio which is my first business that I started with Karyn Lanthois in 1999. Kukan is still going s trong and is being run by Karyn now. Kukan makes games and provides JavaME porting services to many of the leading game publishers including THQ and EA. Podmo started out of a frustration over the lack of opportunity for mobile content developers and the ridiculously high data charges associated with accessing mobile content over a Telco network. I was first looking at some sort of mobile content, Bluetooth vending machine, then one morning after reading through the Bluetooth specification it dawned on me that if we had enough vending machines linked together then we could build a network and it would be cheaper than the technology that the Telco’s are using. Many people told me the idea would never work and that Bluetooth would not have the range or capacity. In fact the opposite is true Bluetooth technology is more than capable of doing what we need it to do, not only can it do it, Bluetooth is inexpensive and it is everywhere. 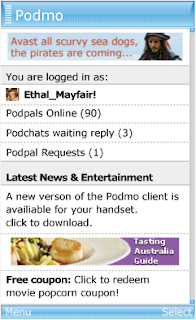 It took about 6 months from the time we decided to set Podm up until we launched the Beta trial in Adelaide last year. However there was a lot of prior knowledge and work that went into the product that came from Kukan. The lead JavaME developer at Podmo Ben Tilbrook who came from Kukan is in my opinion the best JavaME programmer going around. His knowledge of JavaME is extraordinary and really helped us fast track the development. We had also ported several Bluetooth multiplayer games for THQ and developed our own JavaME location based applications back in 2002. To be disruptive by turning the Telco business model on its head. I strongly disagree with the over used phrase “the great thing about mobile is that people are happy to pay for it”. This is total and utter crap. People are sick and tired of being ripped off by Telco’s. They have just never had the choice until now. I am a big fan of the Virgin business model of finding an industry that is dominated by bloated, outdated, high profit companies and going in and doing it better, faster, cheaper and smarter. Shifting the market is what it is all about. Podmo means different things to different people depending on what role they play in the ecosystem. For location partners such as retailers or the education sector we provide them with a Telco in a box. They simply order one of our kits and we provide them with the hardware and software to control their own part of the Podmo network. For advertisers on the network we provide them with targeted location enabled advertising. Like the retailers, advertisers can control their campaigns in real-time making adjustments to improve take-up. Content partners can upload and distribute their content throughout the Podmo network. We provide a simple intuitive upload tool which takes care of porting to all the different devices on the network. For instance I can upload a video that was posted on YouTube to Podmo and Podmo will recompress and resize that video for all of the different handsets. We also supply content developers with a way to sell their content on Podmo to generate revenue in the same way that iTunes does except we solve the device fragmentation issue at the same time. Finally for the user we provide almost exactly the same experience as any of the popular Telco's can except it is 100% free for the end user. The end user can even download our free Podmo server and turn their home into a Podmo zone. Providing Podmo for free means that our end users have the money they would have normally paid to the Telco to purchase content or products that they saw advertised on the network. It's a win win situation all round. Podmo improves the experience for retailers, advertisers, content producers and the consumers. Nobody is left out. Initially we are looking to get as much coverage of the Podmo network as possible so customers like Starbucks and McDonalds are obvious candidates for our technology because they will expose our service to a lot of people quickly. That being said we are working, with educators, government, TV producers, game publishers, content producers, advertisers, small business, broadcasters and of course the end user. In Adelaide we have over 3000 members, roughly 40 location partners, several advertising partners and hundreds of content producers all involved in the Beta trial. The platform and business model has now been fully tested and we are moving into the commercialisation phase of the business. There are several big deals on the table at this point and you will start to see Podmo popping up everywhere around the globe. To date other than the first month of the Beta trial where we ran, TV, online, print and radio advertising, it has been purely online social networking and word of mouth. This is one of the reasons we chose Adelaide as the location for the Beta trial. Adelaide is small enough that people will hear about you quickly. This however, can be a double edged sword. In the beginning of the trial we had some technical problems with our network that are now solved but we still run into people who think that those technical problems still exist. By isolating the trial to Adelaide we hope to learn from our mistakes and avoid these sorts of issues as we branch out. We have our own internal KPI's but for the trial the main issues were, uptake and stickiness for the end user, technical performance of the network and partner development. We have consulted with our initial customers and fine tuned things to the point where we think we are now ready to go. • What is the monetising/revenue model? Is their any new model, which is being tried? Our model is new in the mobile space but it is not new in the rest of the media world. Free to air television, print, radio and online businesses have all relied primarily on advertising revenue to pay for the content they produce. Why should mobile be any different? I think the Telco's charged through the nose and ignored advertising on their networks because they could, not because it was the best model. That leaves the door open for companies like Podmo or Skype to revolutionise the telecommunications business model. We also generate revenue from the sale of content and hardware. When you think about it we have many competitors but no real direct competitors. By that I mean there are many competitors who provide a little of what we do but not the whole ecosystem. For instance a company that provides proximity based Bluetooth marketing is a competitor, a company that allows content producers to self publish is a competitor, a company that provides a WiFi network is a competitor. However none of these competitors provide what we do in its entirety. I guess at the end of the day Telco's are the closest things we have to a competitor but they cannot offer their service for free. They are bound by their business model that requires their customers to pay exorbitant amounts of money to access their network. I keep hearing people talking about the tipping point when data is so cheap that it does not matter. I strongly disagree with this. Telco’s need to keep charging for data to support their high network costs. If the Telco’s weren’t worried about free networks popping up why is the iPhone locked to a carrier and why are there rules about what you can do using it’s inbuilt WiFi? Another example of this flawed logic is the Skype phone on the Three network. People believe it is free VoIP. This is simply not true. Firstly you need to be on a plan or purchase prepaid credit from Three and then the amount of time you can use Skype for is limited. Compare that to running Skype over Podmo and you will see what I mean. Using Skype on Podmo would be 100% free. The primary technologies are Bluetooth and Wifi. We develop a lot of our stuff in Java and our servers are Linux. We are innovating a great deal in the area of Bluetooth by increasing the range and capacity of Bluetooth radios. We are doing a lot of work in the area of mesh networking allowing us to improve capacity and scalability of our network. I don't think such a thing exists. Yes we use open source tools wherever possible. We use OS X, XP, Vista and Linux depending on the application. We have a really strong mobile community in Adelaide and indeed in Australia. We were the founding industry partners in the Mega program and we started and help run MoMo (Mobile Monday) in Adelaide with the AIMIA state chapter. We often catch up at MoMo or other industry events run by AIMA SA. I think being an entrepreneur is great and I wouldn't swap it for anything. I do think though that you need a really tough skin and in Australia our entrepreneurs are highly undervalued. I am very proud of what myself and my team have achieved and I have many friends who I am also very proud of who are doing the same thing. The major problem is nobody really wants to support you until you are a going concern, so it is your job as an entrepreneur to convince as many people as you can that you are going to make it. Of course many don't or at least don't at their first, second or third attempts. This is where we in Australia are really cruel to our entrepreneurs, we knock them on the way up and if they fail we write them off. If they do finally make it we stab them in the back and tell them they are getting too big for their boots. Money for a start-up is very hard to come by in Australia. That is why a lot of our talent heads off to Silicon Valley. But hey it's not all doom and gloom, this environment here makes the challenge even more enticing and I assume the victory even sweeter. Only time will tell. • What do you think of the digital revolution that is breaking the conventional business model for media houses & music companies? I think it is great. Change brings opportunity. Opportunity means progression and growth. Change is a good thing and the incumbents should embrace it instead of fighting it to their own detriment. I am not really in a position to comment on where Telstra is headed. I am sure they are trying to diversify. It would be hard to imagine them competing with Google on any level. The companies are diametrically opposed. •Do you think Telstra is the major player for the future growth of Australia in a digital economy? I think Telstra influences our telecommunications industry greatly. I believe that many of Telstra’s business practices have been put into place to reduce competition and innovation in the market. Of course this is what their shareholders want them to do and they are doing a good job of it. The problem is that it is not good for the industry as a whole. The rest of the industry is really at a disadvantage, especially when you take into account that tax payers payed for the network that Telstra monopolised to put them in the position they are in. Because of this they do not have many friends in our industry. This I think will eventually result in a concentrated effort from the majority of the rest of the industry to remove their power to create a more even playing field. • What’s your thought on Mobile Industry in Australia, esp. in context of it as a games platform/next pc? Do you think we can compete with Japan and South Korea in this space? As you can probably tell I am not a big fan of the current business model that dominates our mobile industry. Change needs to happen and I can see it coming. I go to as many MoMo's and talk to as many industry participants as I can and they are all saying the same thing. Telco's charge too much and give too little back to the developers. I think Japan and South Korea are very different markets and what works there will not necessarily work here. I don’t think we need to compete with them. I think every market is different and it is important to understand those differences. We have a great pool of very innovative and talented mobile developers here in Australia. I just hope they all make it through to the other side. Traditionally this has been a very hard thing to do. • What Government resources have you used to help your business? 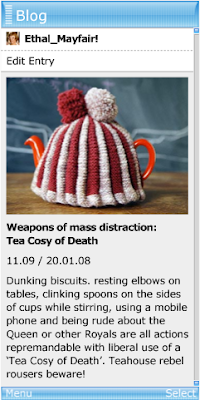 And have they made an impact? We have had a Commercial Ready grant and it has really helped us in the R&D phase of our company. • Have you sought any funding? We have dabbled in VC acquisition. We are just learning the rules of engagement. We have had a lot of interest but have not committed to anything yet. Obtaining VC money is a minefield and there are very few of them in Australia. • Why do you think that we have not created many world class companies in technology based business (except, medical science based) as compared to other OECD countries? I think it goes back to support of our entrepreneurs and especially in the digital media space. In my neck of the woods it is one the most under funded sectors. We need to invest for the future and not for now. Mining is big now but is not going to lead us into the next phase of our evolution. Digital media is an enabler and allows for innovation across many different industries. I think we should be focusing on Green and Nanotechnology. I know that is where my next business will be positioned. I think in Adelaide we are in a very good position at the moment. Both TAFE and Universities, especially Uni SA and TAFE have been very supportive of our industry. The Mega program could not have happened without the support of the education sector. Indeed it was founded by Peta Pash who is from TAFE SA. In my opinion Mega is the best thing going around to fast track our next generation of mobile entrepreneurs. We need more competition in the marketplace. Competition breeds innovation. This debate over or network infrastructure is just getting so boring. Someone needs to step up and sort it out soon. We also need to create opportunity for our up and coming content producers. Currently it is very difficult for our mobile producers to make a living. It is near impossible to get onto a good spot on a carriers deck and even then they will take they lion share of the profit. We should also abolish premium SMS scams. I am sure you know the ones I am talking about. You see a girl in a bikini late at night on TV telling you to text off to this number and something amazing will happen. Then you read the fine print, if you have a bionic eye and it states that you will be sent 2 messages a day at $6.60 for 2 weeks unless you text the word stop whilst standing on your head. These sorts of scams are earning lots of money for those involved and a lot of it is going back to the Telco. It is also telling the public that they cannot trust our industry and that we are all rip off merchants. Many people have been burned by this and high data charges. These people simply do not come back and try mobile content again because we have lost their trust. • At the 2020 conference, PM Kevin Rudd met with top 1000 people from different background to discuss and collaborate on the issues facing the nation. What issues would you have raised if you were given a opportunity to attend? I think I would have had to focus on how difficult it is for our mobile practitioners to earn a living and that a lack of competition in the Telco space is seriously hampering the emergence of new and more equitable business models. I have heard it will be Telstra. It would make sense as the model for the iPhone is to lock you into a carrier for up to 2 years. This sort of model removes competition and stifles innovation, which seems to mirror what is already happening. Steve Jobs really had a chance to take on the Telco's but instead decided to collude with them. I have plenty of advice, some of it may be useful but there is way too much to fit into this interview. My one main piece of advice would be not to do this because you think you are going to be some sort of entrepreneur rock star like Steve Jobs, because the reality is you get little respect for being an entrepreneur and you won't get it until you succeed on a big scale if you get it at all. You need to do it because you have a very active and creative mind. The joy or reward comes out of trying to solve the ever evolving puzzle that never stops adapting. You also need to genuinely enjoy people and being around them. If you cannot communicate well and motivate your team you are dead in the water. You cannot do it on your own. Thanks Che for sharing your thoughts. We look forward to hearing from you in future on the progress of Podmo. All the best for future.